For the fiftieth anniversary of Sputnik, the behind-the-scenes story of the fierce battles on earth that launched the superpowers into space The spy planes were driving Nikita Khrushchev mad. Whenever America wanted to peer inside the Soviet Union, it launched a U-2, which flew too high to be shot down. But Sergei Korolev, Russia's chief rocket designer, had a riposte: an artificial satellite that would orbit the earth and cross American skies at will. 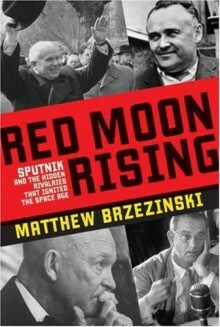 On October 4, 1957, the launch of Korolev's satellite, Sputnik, stunned the world.In Red Moon Rising, Matthew Brzezinski takes us inside the Kremlin, the White House, secret military facilities, and the halls of Congress to bring to life the Russians and Americans who feared and distrusted their compatriots as much as their superpower rivals. Drawing on original interviews and new documentary sources from both sides of the Cold War divide, he shows how Khrushchev and Dwight Eisenhower were buffeted by crises of their own creation, leaving the door open to ambitious politicians and scientists to squabble over the heavens and the earth. It is a story rich in the paranoia of the time, with combatants that included two future presidents, survivors of the gulag, corporate chieftains, rehabilitated Nazis, and a general who won the day by refusing to follow orders.Sputnik set in motion events that led not only to the moon landing but also to cell phones, federally guaranteed student loans, and the wireless Internet. Red Moon Rising recounts the true story of the birth of the space age in dramatic detail, bringing it to life as never before. A well written and excellent account of the competing US and Soviet rocket programs from WWII to orbit. I wish there was a second volume, detailing the actual space competitions.By the way, the audiobook version of this is excellent.